You'd have to have spent the last couple of months under a rock to have not notice that the colour green has made a HUGE come back in a BIG way this year. We're seeing it appear on the high street in beautiful luscious shades of emerald, jade and sage- all of which are undoubtedly a real treat on our eyes. There's something so aesthetically pleasing about these tones and although green is inevitably a very vivid colour, it's also turned out to be a rather versatile one in my opinion. It's such a ridiculously easy trend to incorporate into your summer wardrobe and where I wouldn't normally be a slave for "current flavours of the week" this one I have happily and very seamlessly welcomed into my wardrobe. Two absolute summer staples for my year in, year out are floral midi dresses and skirts! Ordinarily in the past I've been scouring these pieces down in vintage stores but this year there's absolutely no need to put that kind of time consuming leg work in! 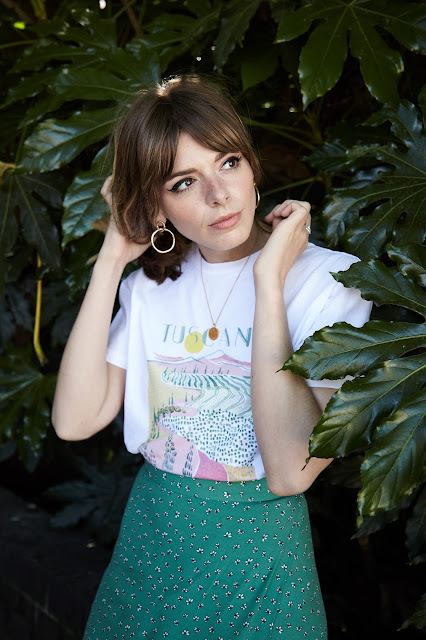 Floral, vintage inspired, "I've just been summering in Naples" style dresses and skirts are a big hit this year and it would seem we're all trying to achieve that slightly French, laid back feel into our summer wardrobes. This being said green is appearing in these style predominantly and I'll be the first to admit it wasn't until this year my eyes have really been opened to a green based ditsy print. Think white florals, small scale, delicate prints. Nothing to loud or garish. 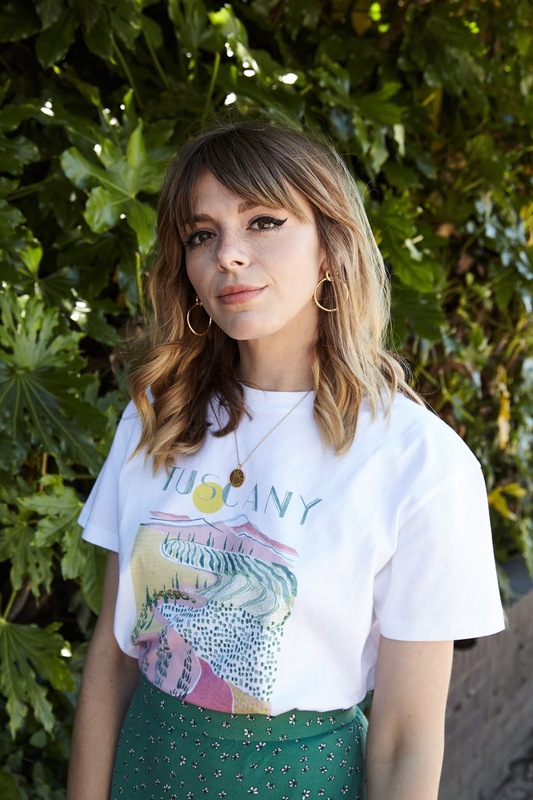 Just the right amount of floral to look ever so slightly elegant but still subtle enough that you can quite easily team it with a boyish slogan tee and high tops. The nice thing for me about greens is how clean it looks styled with complimenting tones of blush pink, lemon yellow and deep, burnt browns. Green is a colour which suits most skin and hair tones and instantly gives your look a fresh, vibrant feel we're all happy to have over summer. 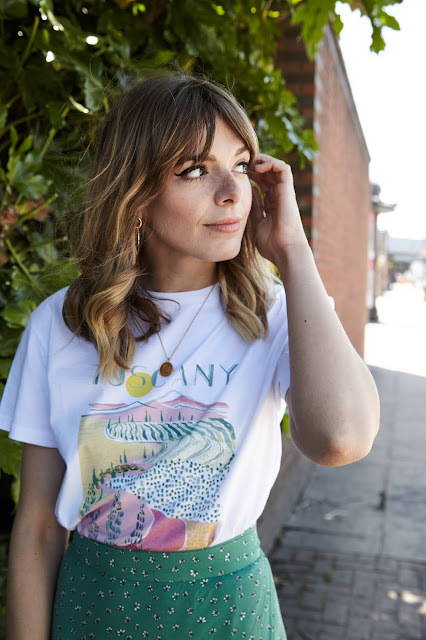 Simply add in some gold jewellery, preferably vintage inspired again and you've got yourself a sophisticated mid-summer dream. 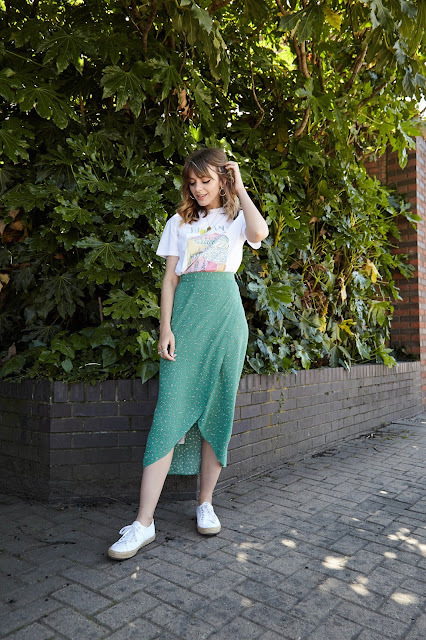 I absolutely adore this recent find I'm wearing from And Other Stories, the cut of this skirt is ridiculously flattering and where I've styled it here with a tee by one of my new favourite brands, Kitri Studios (the print on this tee teamed with the jade of my skirt look like they were made for each other) I would also be super inclined to put it with a Broidery Anglaise style camisole for a slightly more feminine feel. So why are we all so green to envy this year? Personally I think this colour is relaxing. I know it sounds silly but where we've seen loud, jewel tones take over in summer ordinarily it's actually a welcome change to opt for something a little more watered down. The sun is blaring and a tranquil splash of sage green helps level this out. Think sun bleached painted buildings in Italy or a Monet painting... For me there is so much chaos going on around us, a little green in your wardrobe is metaphorically a bit like escaping to your garden after a busy day at work! We're in for a long, hot summer so why not slow it down with a little ethereal in our wardrobes? Cool, calm and collected... I love you because you're green. Hey, nice outfits! I might consider wearing green now, very interesting! And may I ask, where are those earrings from?